Rapper Kanye West was forced to end his New York City performance earlier than expected after news surfaced that his wife, Kim Kardashian West, was the victim of an armed robbery in Paris. “I’m sorry I have a family emergency, I have to stop the show,” West told the audience in Queens. More than 3,600 miles away, five men posing as police officers had handcuffed a concierge at Kardashian’s luxury Paris residence at the 8th arrondissement and ordered him at gunpoint to open her apartment around 3 a.m. local time. The private residence is located near the Madeleine church and is frequented by movie stars and musicians. Several French news outlets reported that two of the five assailants barged into Kardashian’s dwelling, where they gagged her, placed a gun to her head, tied her up with packing tape, and locked her in the bathroom. They then made off with a jewelry box containing valuables worth $7 million dollars, a ring worth nearly $4.5 million, two cell phones, and a wallet with $1,000 in cash. Sources told E! News that Kardashian believed the men were going to kill her and pleaded with them to spare her life. It is unclear if Kardashian was loaned the jewelry or if the jewels are from her own personal collection. The couple’s two children, three-year-old daughter North and 10-month-old son Saint, were not present during the harrowing incident. The gunmen fled the scene on bicycles and are still being sought by local police. “Everything is being done to solve this case and arrest those responsible,” said Paris police, according to The Local France. Special unit officers from the Banditry Repression Brigade (BRB) are investigating the armed heist. Publicist Ina Treciokas said Kardashian was “badly shaken but physically unharmed” after the incident. Kardashian has since left Paris via a private jet after speaking with investigators. Kardashian, her sisters Kendall Jenner and Kourtney Kardashian, and their mom Kris Jenner were in Paris for Fashion Week. 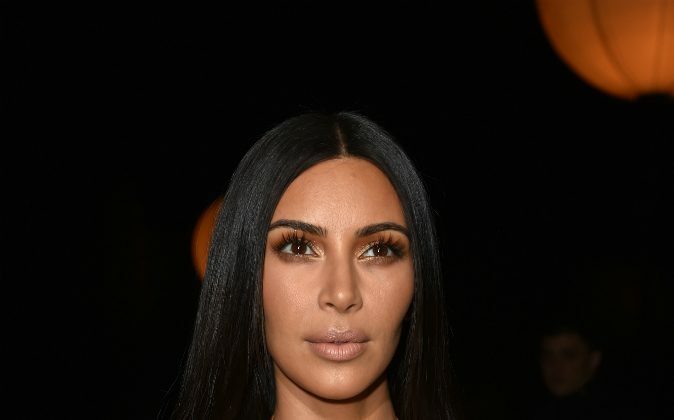 Kim had made several appearances at fashion showings, including Balenciaga and Givenchy on Sunday, and documented the festivities on social media. In one photo posted to Instagram, she posed with supermodel Naomi Campbell; in another she showcased a diamond ring on her left ring finger. It is unknown if the photographed ring was taken in the home invasion. Last week, celebrity prankster Vitalii Sediuk attempted to make contact with Kardashian but was thwarted by her bodyguard, Pascal Duvier. Local politicians fear the the latest incident will deter tourists from visiting Paris. “We can have all the marketing we want for Paris, which costs a lot of money. But all this advertising is rendered pointless by what happened to Kim Kardashian,” she added.